In my experience, the fragrance family with the greatest family resemblance is the chypres. Florals can be shy and retiring (Anaïs Anaïs) or strident and hectic (Versace Blonde); orientals can be potent and spicy (Opium Pour Homme) or soft and luminous (Anne Klein II). But all chypres have the same warm loaminess, because they're all based on the same note: oakmoss, with its dark, honeyed, woody-earthy scent. The original Chypre scent played on the contrast between bright citrus top notes and the mystery of oakmoss. Most chypres are based on these very notes, though some dispense with the citrus top, sometimes replacing it with some other fruit, aldehydes, or other bright notes. Most chypres have, in addition to the invariable oakmoss in the base, earthy or woody notes; patchouli and/or vetivert are usual components, and sandalwood or oriental components such as ambergris and vanilla are also employed. Diva is a floral chypre, with a big fat emphasis on the floral notes. It hurls itself from the skin with a sparkle of aldehydes and a fresh green note backed with honey, announcing itself a chypre from the start. Floral notes, particularly rose (but also jasmine, ylang, and carnation), make up the middle of scent, but they're swimming in that warm-honey oakmoss smell, which slowly wells up to overcome the flowers. The base is the warm sultry notes invariably associated with a chypre--in this case, sandalwood and patchouli, civet and musk, and, to keep the composition from becoming cloying, the spikiness of vetivert. 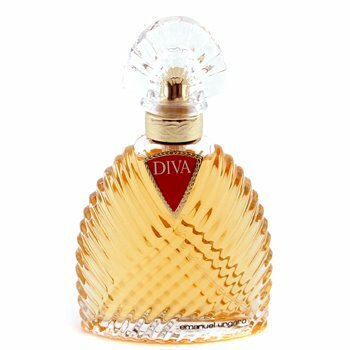 When I discovered Diva in the mid-1980s, I bought a bottle for a drag-queen friend; something about it, the draped-fabric glass bottle, the scent, the brazenness of it all, seemed pretty obviously destined to be worn by the unafraid--by bold women and by the men who wanted to be them for an evening.